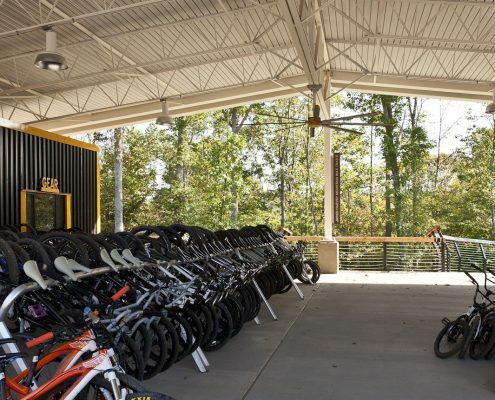 Covered by a large canopy the shop sits at the edge of a hillside and has graceful, elevated ramps that launch and return bikers to the trail systems. 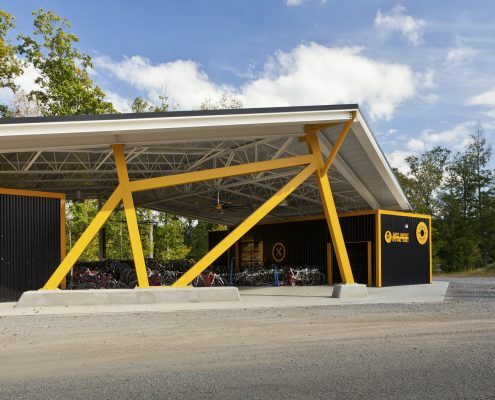 Two support buildings and a bike wash sit under the canopy, clad to mimic over-sized tool boxes. One building houses a retail space and a check-in/check-out room for borrowed gear. 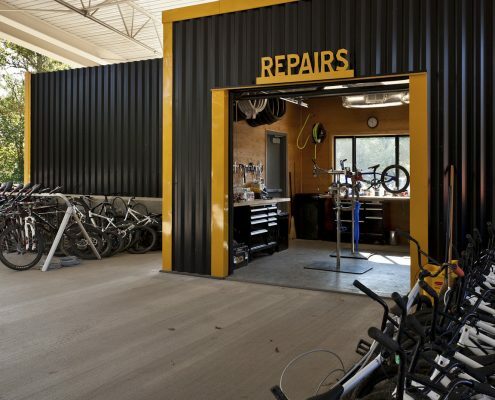 The other building has a demonstration repair shop, storage garage, and an office. Both have toilet facilities, and the interiors are polished concrete floors with stained architectural-grade plywood walls and ceilings. 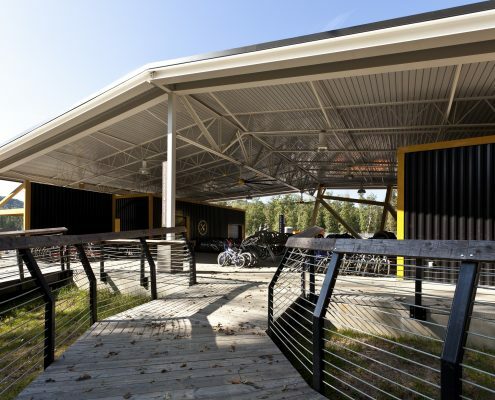 The canopy structure is steel with unique features that mimic a bicycle frame and parts. The canopy roof is white to reflect the summer sun and is insulated to reduce thermal transmission and noise during rainstorms. Two large fans provide comfort from the summer heat. 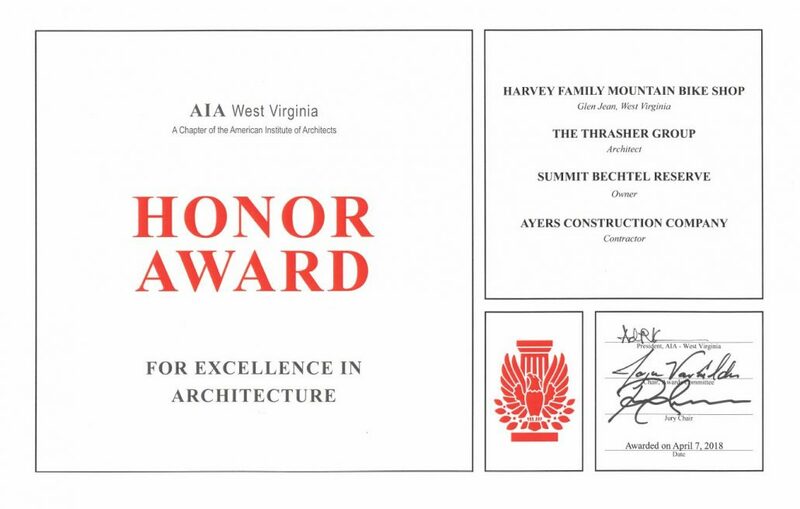 The new Harvey Family Mountain Bike Shop located on Action Point at the Summit Bechtel Reserve in Glen Jean, West Virginia has received an Honor Award from the West Virginia AIA. The Summit Bechtel Reserve is located in southern West Virginia and is a 14,000 acre facility managed by the Boy Scouts of America (BSA). This high adventure camp – opened in 2013 – is used by the BSA and other groups for camping and outdoor activities such as whitewater rafting, rock climbing, rappelling, zip-lining, hiking, archery, shooting, skateboarding, BMX and mountain biking. The Summit has hosted the National Boy Scout Jamboree and will host the World Scout Jamboree in 2019, bringing scouts and families from all over the world to southern West Virginia. 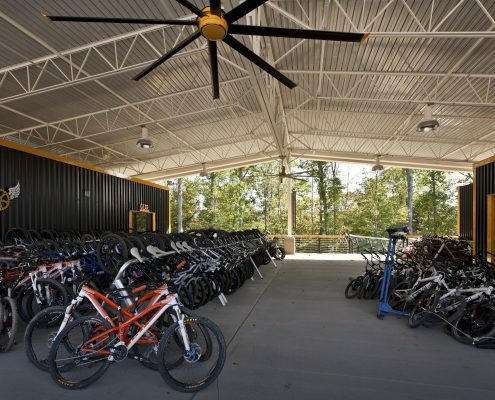 The Harvey Family Mountain Bike Shop is at the hub of BMX and mountain biking activities at Action Point, developed along a mountain ridge with numerous BMX tracks of varying skill level for practice and competition. 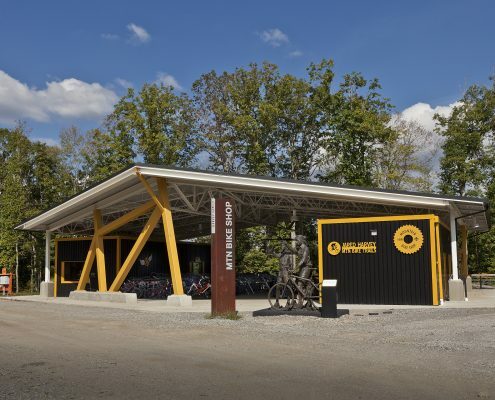 Action Point launches bikers onto miles of mountain bike trails through the wooded hills of Fayette County. 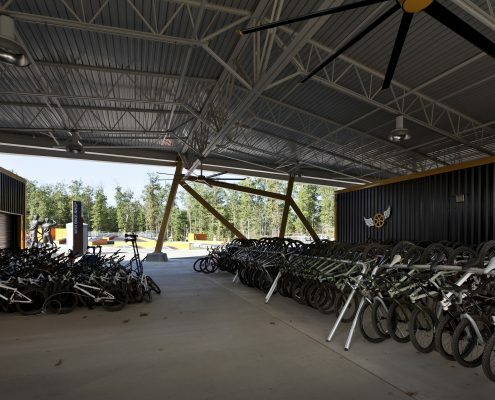 Construction of the Harvey Family Mountain Bike Shop, funded by J. Brett Harvey and dedicated to his son, Jared Harvey, was completed in the summer of 2017. 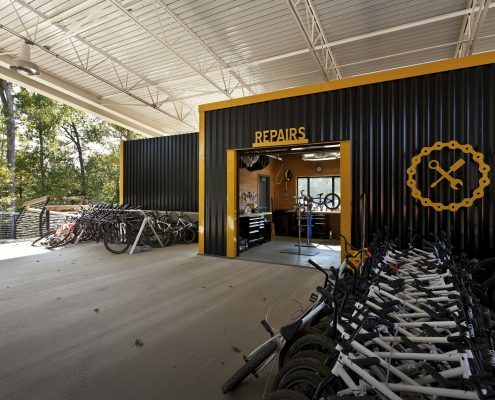 The shop provides a staging area where campers – sometimes hundreds a day – can borrow bikes and gear to enjoy. 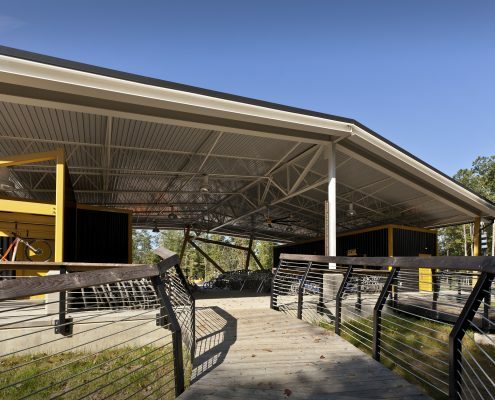 It also serves as shelter to protect campers from rainstorms and the sun.